If you're in the UK, like we are, you'll have heard all about how 4G is going to revolutionise mobile internet and spread across the country like wildfire. We all know that 4G is going to be incredibly quick when you can get it, but before it comes to where we are we decided to find out what speed our mobile internet could get up to. If you're like us, and curios as to what speed you can browse the net on your phone we'd advise downloading the "Speedtest.net" app from Ookla. The app, that looks something like the image on the left is incredibly simple and gives you 3 important measures of your internet's speed. Firstly the app finds your "ping" speed. This number, displayed in the top left of the screen, should ideally be a low number. Below 100 is good with a mobile. 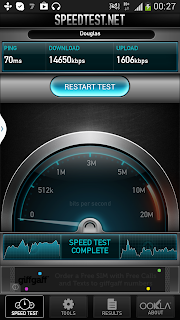 The best we've seen through mobile internet is a 54 so anything better than 50 should be viewed as amazing. The app then finds your download speed. This is how quickly data goes from the internet to your phone. This speed determines thinks like how quickly a movie downloads to your phone, how smooth internet radio or streamed music is and how quick general browsing is. For this test the higher the number the better. 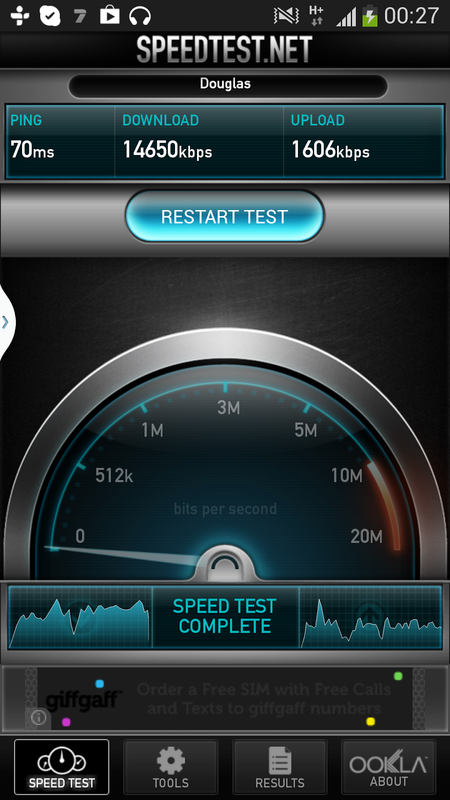 The final test the phone does is find your upload speed. This number relates to how long it takes to upload things, for example pictures to facebook and videos to youtube. As with the download speed, a bigger number is better though it'll be incredibly rare for this number to be anywhere near your download speed (in fact it'd be a shock to even be 1/2 of your download speed). Unfortunately whilst the three tests are excellent, you speed can change at a moments notice, doing tests one after another can render very different figures due to changes outside of your control. Unfortunately this is just something you will need to put up with. Note-If you're ping is over 1000 and your download speed is 0 it's often best resetting your phone's internet and doing another test as it's likely your phone isn't actually getting a "true" connection at that point. Nice blog useful for those who dont know anything about how to check the speed of internet in mobile phones ....I usually check the speed of my internet connection in my mobile using sites like ScanmySpeed.com they will measure the internet speed ie both upload and download speed in Mbps ..
Appvn Apk is accessible on Android. Try not to stress over installments on Appvn Apk since all applications are for nothing in this application. Appvn is likewise perfect with iOS gadgets, and there is no cost required to download and introduce. appvn apk download for window 8.1/10 Appvn is additionally perfect with Windows OS. Appvn Apk can be fitted to the PC utilizing BlueStacks or an alternate Android Emulator. tutuapp android pokemon go is not need much speed internet phone and you can download it any kind of phone model, follow the link and download pokemon go game today. itube pro apk download is the best app in the market to download and watch youtube videos in the background. kodi firestick update now available in linked website and you can download it free of charge. descargar tubemate download helps to get all the latest videos into yor iphone or imac easily. install the tubemate app today and enjoy. install tubemate apk to your mobile today and download all the latest videos from youtube and twitter. Do you mind if I quote a couple of your posts as long as I provide credit and sources back to your website? My website is in the exact same niche as yours and my users would really benefit from a lot of the information you provide here. Please let me know if this ok with you. Thanks a lot! Site here: Top Encryption Software Guide! & Here Are 6 Ways To How To Encrypt A Password For Free Faster.